Live like a child. 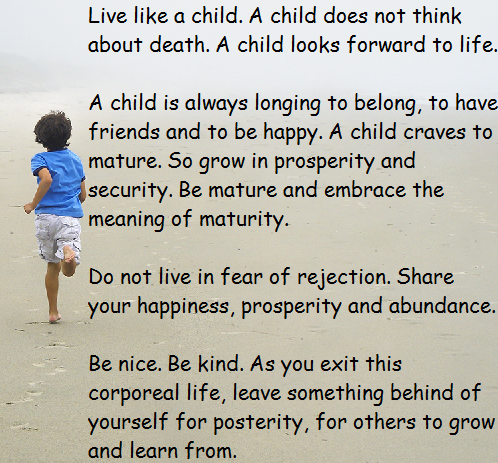 A child does not think about death. A child looks forward to life. A child is always longing to belong, to have friends and to be happy. A child craves to mature. So grow in prosperity and security. Be mature and embrace the meaning of maturity. Do not live in fear of rejection. Share your happiness, prosperity and abundance. Be nice. Be kind. As you exit this corporeal life, leave something behind of yourself for posterity, for others to grow and learn from.